Homeowners know that there is a long list of things which could go wrong when it comes to their property. 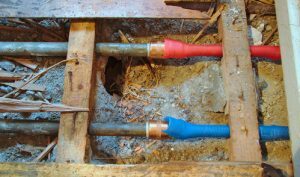 A slab leak – water leak coming from a copper pipe under the concrete foundation – is among the most severe ones and requires immediate leak repair. One of the ways to be certain is to look for signs of slab leak throughout your house, because picking up on them can make a whole world of difference. If you spot them, it is time to call the slab leak detection San Diego professionals. Here are some of the common causes of a slab leak. House construction is a long and tedious effort and sometimes contractors can make mistakes which can lead to larger problems in the future. One of those mistakes can be installing water pipes improperly, which can to a slab leak further on. Also, during construction, some materials get banged, dented or kinked, and this can happen to the pipes, producing a similar effect to bad installation. A slab leak can occur due to your house shifting over its foundation. If such a case occurs, it means your pipes will most likely feel at least some pressure. Soil can shift if it contains large amounts of clay, which expands when wet and shrinks when dry. This is especially true for areas prone to landslides and earthquakes, which bring a higher degree of influence on the pipes. A high water pressure in pipes can be the result of many things, some of which are the abovementioned ground shifting and earth movements. Whatever its cause, high water pressure can have a serious effect on the pipes, causing leaks. Since water is what flows through your pipes on a daily basis, it being a poor quality can cause severe damage from inside the pipes. If the water is too basic or too acidic, this is a problem for the pipes. You might want to check the pH level in order to be sure the water quality is proper. If you find signs of poor quality, the water needs to be neutralized so the pipes don’t get damaged. It is sometimes considered one of the most common causes of a slab leak, because pipes are often exposed to a surroundings which can damage them. Since they tend to expand and shrink due to hot or cold water flow, they can come in contact with other pipes, concrete, or gravel. Over time, this contact causes tearing and smaller or larges leaks. No matter how old your house is, you should always feel secure. This is why a timely slab leak detection if one of the most important aspects of staying safe. KIC Restoration is your best choice, because we offer the best slab leak detection and repair and are happy to inspect your property upon your call.